Are you over winter already? 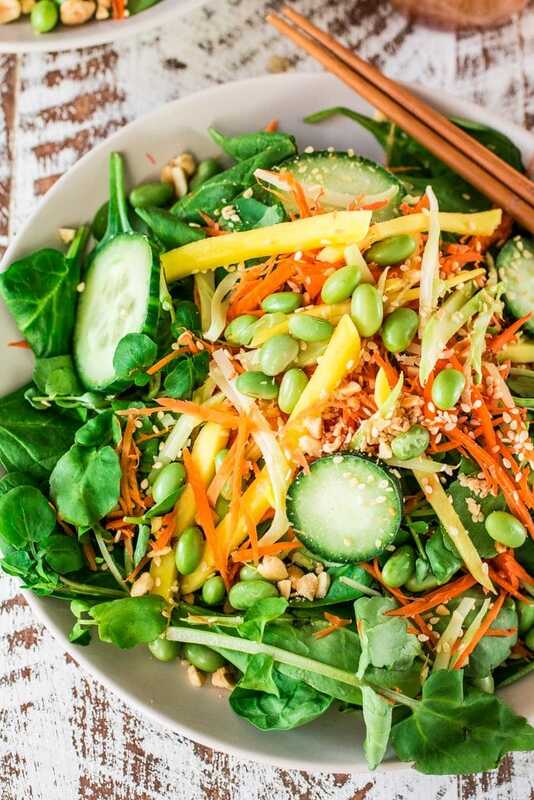 Bring spring to your tastebuds by making this refreshing and nutritious Asian Salad made with spinach, watercress, carrots, broccoli stems, mango, cucumbers, edamame, crushed peanuts and a delicious sesame ginger vinaigrette! It’s not like it was hard, since I didn’t step a foot out of my apartment. My husband, on the other hand, had to walk our dog 3 times, go to the pharmacy (to buy milk so we could make hot chocolate) and then go outside with a thermal of hot chocolate for the two poor guys who were working non-stop in our building’s courtyard. Before you start thinking that I’m a terrible wife for not offering to do at least one of those trips into snow land, let’s remember that Tim was born and raised in this weather while my poor Brazilian body grew up in a tropical climate and has only participated in 6 winters. ? Anyways… After spending the whole day inside on Saturday, we woke up to a beautiful sunny Sunday and I got inspired to prepare a wonderful spring/summer-ish meal. So this Asian Salad was born! I also couldn’t resist frying up some delicious Pagoda Egg Rolls to go with my salad. Because who needs take out when you can make a meal like this at home? 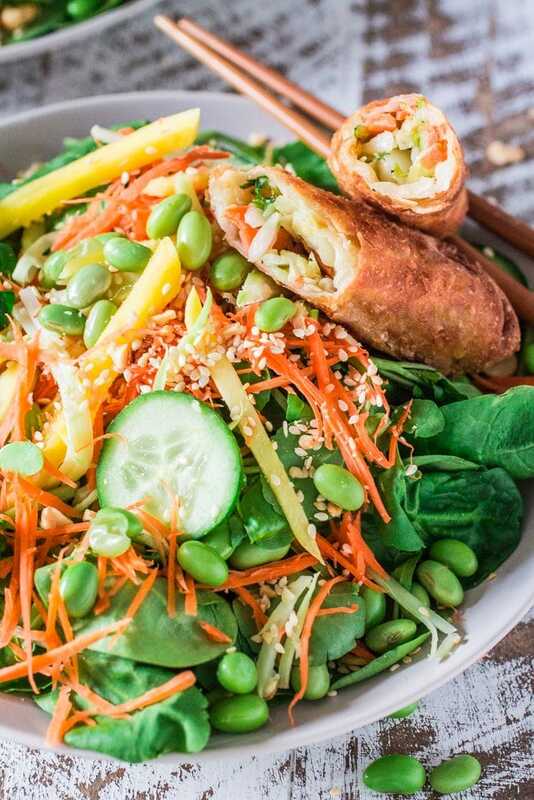 This bright and colorful salad, paired with the egg rolls, would be a great way to celebrate the Chinese New Year (which happens this year from February 7th – 13th), don’t you think? But before you yell at me, saying “This salad is not Chinese, woman!”, let me tell you that I’m in no way claiming any authenticity here. As much as I love Asian food, I’m a beginner, to say the least, at making Asian recipes at home. Getting more familiar with it (and posting more Asian recipes here on the blog) is definitely on my bucket list for 2016! The idea for this salad came from a similar salad I had at a burger joint once. I fell in love with the flavors and took note of what I saw on my plate and what was described on the menu. Then I came home and played mad scientist in the kitchen until I created something that tasted just like what I had that day. 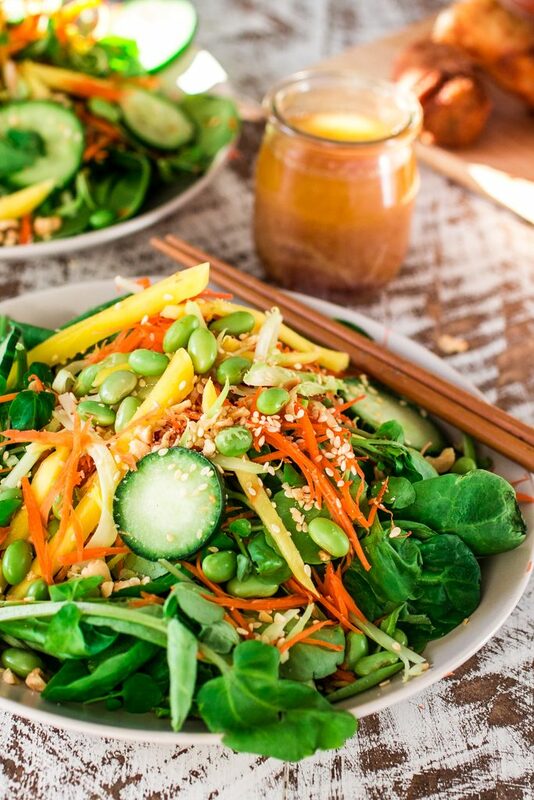 The thing I love the most about this Asian salad is the sesame ginger vinaigrette. I’m usually not a ginger fan, but ginger dressings? I could drink that stuff by the gallon! Weird, right? Go figure! Making the dressing is easy peasy: just blend all the ingredients in the blender and drizzle over your salad. What could be easier than that? As for making the rest of the salad, one could argue that julienning the veggies might require some skills. I use a mandolin, but you can totally use the food processor! If you don’t own any, just chop everything as thinly as you can. It will taste divine regardless! I know what you’re thinking: Can I add chicken to this salad? And the answer is: HELL YEAH! Chicken would be a great addition here. You can either use leftover chicken, grill some chicken or… wait for it… serve it with some chicken egg rolls from Pagoda! You saw that coming, didn’t you? 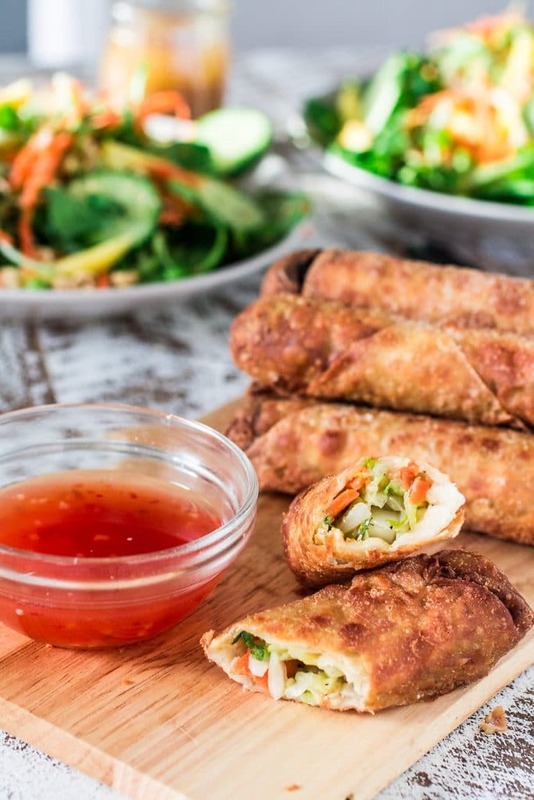 But, seriously, who doesn’t love egg rolls? Especially when you get to grab them from the frozen section of your grocery store. And the best thing is that they do not taste frozen at all. Pagoda’s motto is “Everything your hunger demands”! Their egg rolls have no MSG, no artificial colors and they use 100% white meat chicken. Interested in trying? Before you run to the store, don’t forget to grab a $0.50 discount here! But now tell me, what are your Chinese New Year resolutions? Mine is to eat more delicious Asian food! ? Combine all the ingredients in the blender and blend until smooth. Reserve. Start by cooking edamame according to package instructions. Place all the salad ingredients (including the cooked edamame) in a bowl, drizzle with the dressing and toss. Garnish with sesame seeds and crushed peanuts and serve. The dressing can be made ahead and refrigerated for up to 3 days. You can also cook the edamame ahead of time and refrigerate until ready to use. Dressing recipe slightly adapted from The New York Times. Happy to read you guys made it through the snow weekend craze safe. I have family in Nashville and they had quite a bit of snow. This salad has all sorts of good stuff in it, especially your edamame addition. I am a big ginger flavored dressings as well, thanks for sharing! Thanks, Kevin! :) I hope your family made it through the storm okay. I bet they are not used to that much snow down there. I think the only reason we got it so hard is because the weather gods decided it wasn’t fair we haven’t had any snow yet! So they sent the 2nd snowiest blizzard in history. Ha! Glad you survived the blizzard :D This salad looks SO good, love all those goodies you have in there, and those spring rolls look to die for, too! Oh my god yes I have watching the news,, crazy snow! Glad you guys are okay! I love the dressing , need to try! Stay warm! looks delicious! I’m actually loving that distressed base, did you make it? Yay to surviving snow-zilla 2016! So nice of your hubby to run all the errands AND deliver hot chocolate to the workers outside! LOVE this asian salad, Olivia! SO much yum going on here – the colors, textures and flavors – LOVE it! And I happen to love love love ginger, so any type of ginger dressing makes me swoon! This salad is absolutely perfect, and I can’t wait to give it a try! Cheers, doll! 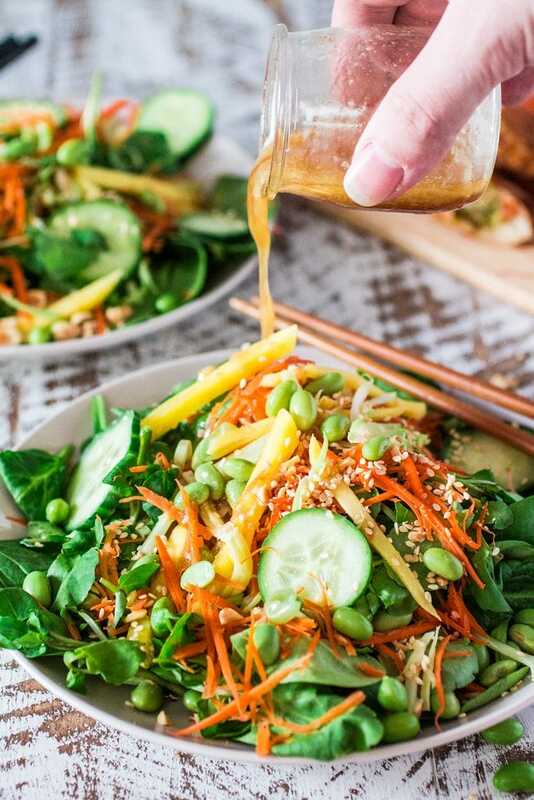 This salad looks so fresh, crisp, and delicious — and ginger dressing is one of my favorites! What a great recipe to pair with Pagoda snacks. Glad you survived the snow storm, I heard it was a lot of snow! This salad looks gorgeous! And the dressing -delicious! Can’t wait to try it!